We are a nation of dog lovers. There are so many of us that we influence our communities, businesses and animal welfare laws for the better. Compared to a decade ago, we can practically take our dogs with us everywhere now. Soon it will become natural for us to take our dogs with us when we decide it’s time to move into a senior living facility. When I read an article about the U.K. moving away from its own status as a nation of dog lovers, I thought that it was a good topic to pose to the Grouchy Puppy community on Facebook for comment. One responded with a perspective of being a recent ex-pat to the U.K. with three greyhounds. Because I believe in the positive influence from sharing our personal experiences, I asked Cindi if she’d share a series of guest posts on what it was like for her to move from the US with her dogs, and to answer some questions about what life is like for dog lovers there. The condensed version of my move to the U.K. was, gee, get everyone their vaccinations, ship the dogs over, rent an apartment, pay the pet deposits and easy peasy, right? WRONG. SO. WRONG. When I first moved to Scotland, the entire process brought me to tears several times. I should also point out, large-scale apartment complexes do not exist here like they do in the U.S. For example, you may have a big high-rise building in your city, but only 50% are rented out by agencies or private landlords. Most rentals here are private apartments (more akin to condos) or homes rented out by property management companies on behalf of private landlords. How did all my friends with dogs in various parts of the U.K. do it? No Pets. No Children. No Families. Why was I having so much difficulty? Granted, I have big dogs (60-80 lb. range) but it shouldn’t be so hard, right? Apartment and houses alike always had the dreaded words “no pets” in the advertisement. But in a bit of comeuppance, it was equally gratifying to see homes and apartments advertised as “no children” or “no families” meaning they would only rent to professional singles or couples. I was also lucky and in a position to pay 6-12 months of my rent up-front (and as a foreigner, many landlords required this as well) as a bargaining chip to allow my dogs. After some desperation, I used social media to my advantage and lamented my plight to a local reporter, who called me when I was still in the U.S., about the lack of housing (and affordable housing) for pet owners. Thankfully, this article ended up being published, and I was able to use it in “selling” myself to potential landlords! Our Senior Dog Journey continues with "Bobo and Jameson"
I don't know why but I am profoundly touched by senior dogs, and the people who foster and adopt them. This is why I am sharing a series of guest posts from Karl and Jessica Schneider. They regularly share their stories and photos on the Grouchy Puppy Facebook wall. I had wanted to have one or two of their dogs be a featured reader of the monthly newsletter, but then Karl sent me the most wonderful story of their journey into the world of senior dog adoption. It is a long story featuring many dogs, and perfect for anyone interested in fostering or adopting a senior dog. They joyfully demonstrate the positive influence of a dog many times over. Their story is long with each dog playing a meaningful role, thus I chose to spread their stories into a 3-part series. Their story begins with Tara, and follows with Bobo and Jameson. I hope their story resonates with you, as it has with me, and look forward to your comments. Our Senior Dog Journey "Bobo and Jameson"
Jameson was about 10 years old, and had been at animal control for 7 days. His time was up. Fortunately, someone that worked there took a shine to him and brought him home. We scheduled a meet and greet, this time at the foster Mom’s home. As before, we had two dogs who didn’t immediately take a shine to each other, but Jameson definitely took a shine to me. We told the foster mom that we would take him home right away. She was surprised, but could see the conviction on our faces. Jameson fit right in. They quickly became our “Grumpy Old Men”. It was like they had been together their entire lives. Jameson helped Bobo, and us, to move on from the loss of Tara. Bobo: Jameson, you’re in my spot. Jameson: So what, I was here first, go lay somewhere else. Bobo: That’s my spot, why don’t you go lay somewhere else. Bobo: I’ll sit on you. And then he sat on him. It was one of the funniest things we had ever seen. There was never a growl or a bark. We have so many great Bobo and Jameson stories that I could go on forever. Jameson was just an amazing dog. Guest Post: Our Senior Dog Journey, "It began with Tara"
Maybe it's because I'm old. Maybe it's my wonderful memories of my own old dog. I don't know why but I am profoundly touched by senior dogs, and the people who foster and adopt them. This is why I am sharing a series of guest posts from Karl and Jessica Schneider. They regularly share their stories and photos on the Grouchy Puppy Facebook wall. I had wanted to have one or two of their dogs be a featured reader of the monthly newsletter, but then Karl sent me the most wonderful story of their journey into the world of senior dog adoption. It is a long story featuring many dogs. It is perfect for anyone interested in fostering or adopting a senior dog. It joyfully demonstrates the positive influence of a dog many times over. Their story is long with each dog playing a meaningful role, thus I chose to spread their stories into a 3-part series. I hope you enjoy each post, and look forward to your comments. Our story begins like many good ones do. We never set out to adopt senior dogs, but shortly after Jessie’s mother passed away, her chocolate lab, Tara, came to live with us. She was 8 years old at the time, and was the most amazing dog you could ask for. She was our first. Tara was an only dog with us for almost 7 years. She really enjoyed being an “only” dog and to be honest, didn’t really get along that great with other dogs. We were just fine as a one dog family, and didn’t really have any plans to get any more. That was until one year when she was almost 14 and our neighbors asked us if we could dog-sit for their dog, Lilly, while they went on vacation for a week. Tara had gotten mellower in her senior years so we said yes with some trepidation. We were surprised at how well they got along and even played together. It wasn’t long after that experience we started looking for a companion for Tara. We didn’t have a lot of guidelines. We just knew it should be an older dog, and not a younger more active one. Tara enjoyed her nap time and quiet time, and we didn’t want to take that away from her. One day while I was out of town for work, Jessie texted me a picture of a dog (Bobo) that was featured in our local newspaper. He was a 12 year old chocolate lab boy, very close in size to Tara. We called the rescue that was sponsoring him and set up a visit at our home. I wouldn’t say that Tara and Bobo hit it off right away, but she also didn’t give us any signs that she didn’t like him either. As his foster mom was telling us his story, and hers, we realized that he needed to stay with us right then. I think his foster mom was a little surprised by our reaction and tried to talk us out of it, but we both knew that he needed to stay with us. This is really where our senior dog rescue story begins. When you experience the love, devotion and joy having an older dog in your life, it's as if you've glimpsed heaven on earth. I will always remember my dog Cleo and how she made me feel as she became a senior dog. As a way to honoring her positive influence over us, we're sharing on Grouchy Puppy beautiful images and stories involving the relationship between people and their older dogs, from Project Unconditional. Read the following story about an amazing woman, who I admire greatly, dedicated to making a difference in the lives of senior dogs. Patty Stanton’s first experience with the joy of senior dogs was watching her childhood dog, Happy, age along with her. Decades later when it came time to adopt a dog for her own family, she luckily found Muttville Senior Dog Rescue in San Francisco. When it comes to adopting a senior dog, the decision is easy for Patty. “They come with manners,” she says, “and what you see is what you get.” The gratefulness of adult dogs is apparent from the beginning too, and Patty relishes the unique opportunity to shepherd senior dogs through their golden years. Patty now serves on the board of directors at Muttville where she can continue her passionate commitment to creating better lives for senior dogs through rescue, foster, adoption, hospice, and education. Project Unconditional by Jane Sobel Klonsky is a collection of photos and stories focusing on the powerful relationships between people and their older dogs. Visit Project Unconditional for more photographs and information, and keep up with the project on Facebook. As a way to honoring our senior dog's positive influence over us, we'll be sharing on Grouchy Puppy beautiful images and stories involving the relationship between people and their older dogs, from Project Unconditional. Read this story about a wonderful family who opens their hearts and home to frightened older dogs. 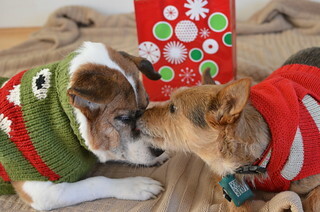 They offer compassion and love to those who need it the most, senior dogs looking for a forever family. Photographed here with their senior rescues Stella (11, French bulldog), Roxy (11, Chihuahua-Dachshund-mix), and Cocoa (10+, Chihuahua-mix), Joe and Rafael introduced me to Patty Stanton and my new friends at Muttville Senior Dog Rescue in San Francisco. Joe and Rafael’s first senior foster dog was named Misty Kay Maybelline. She was, as Joe describes, “odd looking,” but they quickly fell in love with this “cranky old lady.” Misty Kay became a permanent member of the family until she passed away three years later, and during that time many more dogs came and went from their home. This year I lost my sweet old dog Cleo. She was my first adopted dog. I say first because our experience of having her as a member of our family was so completely life changing, odds are we'll be adopting future canine family members. My husband and I remain incredibly grateful for having had the chance to bring Cleo into our lives and family. As a senior dog, life with her only got better too. As a way to honor her positive influence over us, we'll be sharing on Grouchy Puppy beautiful images and stories involving the relationship between people and their older dogs, from Project Unconditional. Jean Kind is surrounded by rescues. “Everyone is a rescue in my family,” she says. Each dog that arrives at Jean’s home has its own unique story, and in the face of the enormity of the need in rescuing abandoned dogs, these stories have helped Jean realize how profound it can be to make a difference in the life of one dog in the moment. What if shelters spent less time on blame and more on helping keep pets in homes? Editor's Note: This is a guest post from Maggie Marton, of Oh My Dog Blog. Maggie continues where she left off last week, in "Take off your Judgey Pants: Let's Discuss Pet Adoption". Today she discusses how we all might benefit (the community, the owner, and the animal) if shelters and rescues concentrate more on helping a pet owner keep their adopted animal, rather than blaming them for surrendering the animal. I'm pretty sure that my spoiled pooches have more than they need. What do you get the dog who has everything? As a wise cat once said (thought bubbled? ), "It's not the giving. It's not the getting. It's the loving." So, this year, I'm going to give the gift of love.